The home-furnishings retailer gained thanks to a strong report by Restoration Hardware. Shares of Williams-Sonoma, Inc. (NYSE:WSM) were riding higher last month after a solid earnings report and a boost from RH Inc (NYSE:RH), formerly known as Restoration Hardware. RH surged on its earnings report at the end of the month, which investors saw as a bullish indicator for the high-end home furnishings sector. 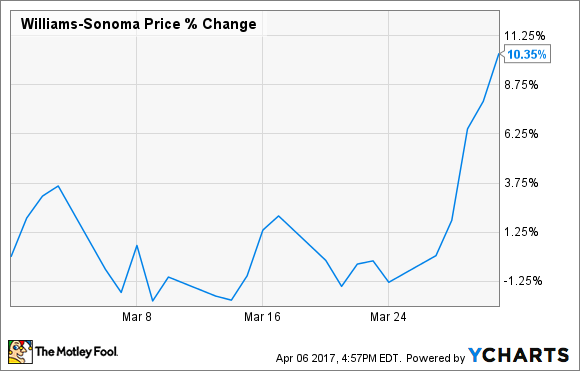 According to data from S&P Global Market Intelligence, Williams-Sonoma shares finished the month up 10.4%. As the chart below shows, the bulk of the gains came at the end of the month. Shares of the home-furnishings retailer gained modestly after its holiday-quarter earnings report on March 15. Comparable brand revenue declined 0.9% in the period, while earnings per share was flat at $1.55. That result nonetheless beat estimates at $1.51. Performance remained strong at West Elm, and the company saw modest growth at Williams-Sonoma-branded stores. However, Pottery Barn continued to underperform, with a decline of 4.1% in the fourth quarter. What really propelled Williams-Sonoma higher was strong results from RH at the end of the month as the struggling retailer seemed to bounce back from a disastrous 2016. RH beat earnings estimates in the fourth quarter and posted better-than-expected guidance for the first quarter. Since Williams-Sonoma and RH cater to a similar clientele, the stocks tend to track together, but that may be a mistake -- RH had a number of self-inflicted wounds last year, including shipping delays that caused the stock to plummet. Williams-Sonoma is also better diversified and has more affordable brands than RH. Looking ahead, Williams-Sonoma guided for earnings per share at $3.45-$3.65 this year, a modest improvement from $3.43 last year. It also sees comparable revenue growth of 1-3% with overall revenue growth of around 2.5%. With its respected brand family and strong e-commerce business, Williams-Sonoma is in a better position than a lot of retailers, but its modest guidance means investors shouldn't expect many more breakouts like this one this year.